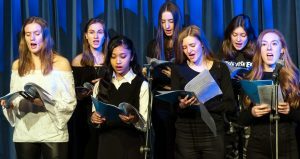 WOKING College students battled against the freezing weather last week to stage their annual Evening of Note concerts. Unfortunately, Storm Emma took hostage the concert planned for Thursday, which has been postponed. However the show on Wednesday was a true winter warmer. The offering on Wednesday night had a classical and jazz tone with some new and innovative student arrangements and compositions, with music by diverse composers.